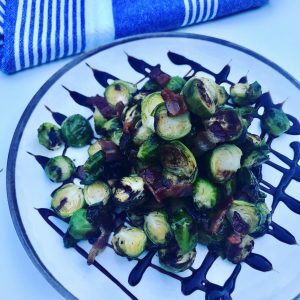 We love Brussels sprouts just about any way we’ve ever had them. Raw, roasted, pan seared. You name it. Tossed with balsamic and bacon? Ummmm, this combo is tops on our list. With all this goodness packed into one dish, we don’t want to go overboard, but sometimes we guild all the deliciousness with a sprinkle of fresh thyme, if we have it on hand. Cut bacon into small bits. Cook over medium heat, stirring frequently, until brown and crisp, about 10-15 minutes. Transfer bacon to paper towel-lined plate. Set aside. Cut off the root ends of the Brussels sprouts and pull off any yellow outer leaves. Cut them in half lengthwise. Mix in a bowl with the bacon fat or olive oil (or a combo of the oils if bacon does not render enough oil), salt and pepper. Pour them on a sheet pan and roast for about 15 minutes until crisp on the outside and tender on the inside. (For larger Brussels, a little more cook time is necessary.) Shake the pan from time to time to brown the sprouts evenly. Transfer hot Brussels sprouts to a bowl, add the bacon and toss with a generous helping of balsamic syrup, more S & P to taste. Serve warm. Garnish with a drizzle of balsamic glaze if you like. Note: If the bacon does not render enough fat, feel free to augment with olive oil.